X-Men wasn’t the only comic-book animated series to debut in 1992, and it’s pretty tough to argue it was the better one, since Bruce Timm’s Batman: The Animated Series hit screens a month before and had an impact that’s still reverberating through a genre it helped create. X-Men didn’t have quite the visual panache of Batman, nor its dark sense of atmosphere. But it had quite a few things going for it—most notably, the fact that it was working off of 30-odd years of X-Men comics, giving it fantastically deep benches for its heroes and villains. It also had some fine story material to crib from and embraced serialization as well as any Saturday morning cartoon could. X-Men launched as its comic-book counterpart was enjoying new, unheard-of heights of success. Chris Claremont had shepherded the series into the mainstream zeitgeist over the 1970s and ’80s, and wrapped his run soon after the 1991 release of X-Men (Vol. 2) #1, which still holds the Guinness record for copies sold (somewhere around 8 million). Under his guidance, the super-powered mutant team had grown in size and diversity, clad in individualistic, brightly colored outfits with a range of powers so that everyone under the sun could have a favorite. 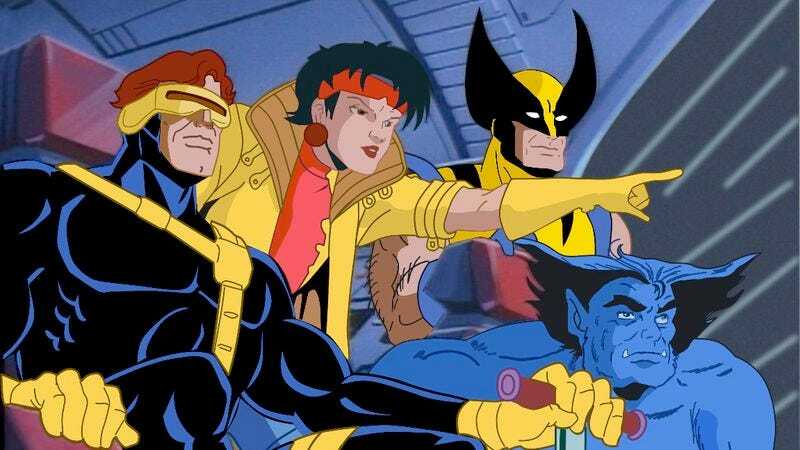 In 1989, Marvel took its first swing at an animated show with X-Men: Pryde Of The X-Men, a fairly cheesy pilot for a series that was never developed, but that displayed many of the hallmarks of its successor. The actual X-Men series stumbled out of the gate, its first two episodes littered with errors and missing scenes that were not cleaned up until its re-airing a year later. But its impact was immediate and it’s still the longest-running animated show based on a Marvel comic, lasting 76 episodes over five seasons (although the final six episodes produced by a different, Philippines-based studio and have a jarringly different feel). X-Men covered its bases over the years when it came to the show’s vast ensemble, but each week, the opening credits lay out the core super-team, assembled from various lineups through the series’ history, but largely inspired by (and visually mimicking) the Jim Lee-drawn, early-’90s Blue Team. There’s earnest stiff Cyclops; his telepathic and telekinetic partner, Jean Grey; brooding anti-hero Wolverine (their love triangle is alive and well, even on a show aimed at kids); isolated southern belle Rogue; her card-chucking, Cajun beau Gambit; intellectual Beast; weather-commanding Storm; and wheelchair (well, wheelhover-chair)-using Professor X.
There’s also Jubilee, a spunky teen and an audience surrogate who had been introduced in the comics just three years prior. Kitty Pryde/Shadowcat had this role in Pryde Of The X-Men, but Jubilee is an even more heightened take, spewing ridiculous fake-slang and running around in a yellow raincoat, square pink shades, and what appear to be rubber kitchen gloves for no apparent fashion reason. It doesn’t help her “worst-character” reputation that her mutant power is shooting fireworks out of her fingers—although for some, the ridiculously accented Gambit took that prize with his Pepé Le Pew-level flirting. The characters of X-Men lean heavily on catchphrases and broad tropes. Beast quotes a lot of Shakespeare. Wolverine is always growling and popping his claws. Storm describes her weather-summoning powers in ridiculously florid fashion even when she’s just conjuring a rain cloud to put out a kitchen fire. Rogue can’t end a sentence without saying “sugah.” Cyclops is… well, he’s boring and he gives everyone orders. That’s what Cyclops always does. But the repetition never becomes grating—in fact, it’s charming in the way any great superhero comic book can be (Claremont’s writing leaned on all the same traits). X-Men’s real achievement came in its use of serialized storytelling, borrowing some of the comics’ most epic arcs and either cribbing from them pretty straightforwardly (like the “Phoenix Saga”) or updating them nicely to mix with the series’ ’90s style (like “Days Of Future Past”). Most of the episodes were standalones, especially in the early days, but as the series progressed, it ran longer and longer plots of surprising narrative depth, and managed to keep its Saturday morning audience hooked. The show didn’t shy from X-Men’s classic hallmark of exploring themes of prejudice and racism, and never presented villain Magneto (who seeks mutant supremacy as a counter to Professor X’s dreams of integration) as a one-dimensional baddie. “Slave Island” (season one, episode seven): After a few episodes that set up the series’ main villains, including Magneto, and Wolverine’s rival Sabretooth, the show aired its first truly interesting episode, set on the mutant-hating island Genosha. The symbolism is heavy-handed, with Gambit, Rogue, and Jubilee enslaved with explosive collars around their necks and forced to build a dam, but it’s there nonetheless. Genosha is broadly an allegory for any kind of slavery, but has specific whiffs of South African apartheid in its setting and militaristic visuals. The imagery of Master Mold, a giant anthropomorphized Sentinel factory, is nicely nightmarish, too. “Days Of Future Past” (season one, episodes 11-12): The original “Days Of Future Past” arc, one of the most influential comics stories ever, is a tough act to live up to. (Good luck to Bryan Singer, who’s adapting it to film next year.) The series not only handles it with aplomb, it mixes it with another comic book plot—the introduction of Bishop, a mutant policeman from the future—without skipping a beat. Opening in the future where an aged Wolverine is the last survivor of an apocalypse that wiped out the X-Men, the two-parter has terrific fun playing around in its haunting future before dumping Bishop in the past as he tries to stop the events that led to everything going wrong. There are many memorable moments here: the terrifying, mutant-hunting Nimrod; the reveal of Mystique; Bishop shooting everything with a giant gun (hey, it was the early ’90s). “Repo Man” (season two, episode five): This episode was scripted by Len Wein, who helped create the Wolverine character and wrote the iconic Giant-Size X-Men #1, and was the only major comic book figure to write on the show. “Repo Man” focuses on Wolverine’s past by having him return to Canada and meet members of the country’s premiere super-team Alpha Flight, filling in details about the Weapon X program that created him. The series followed the same formula for Wolverine as the comics, immediately establishing him as a killing machine and an utter mystery, and slowly peeling back layers of his character and his backstory to maintain audience interest. In the 1970s, his status as a breakout character was something of a surprise, whereas here he was established as the star of the show, but the approach still works nonetheless. “Time Fugitives” (season two, episodes seven-eight): Time travel and alternate reality is bonkers stuff for Saturday mornings, but X-Men quickly realized what fertile territory it could be. “Time Fugitives” features two time-jumping, gun-toting, muscle-flexin’ heroes, Cable and Bishop, and sees them working to prevent a mutant plague, or a temporal storm, or both. It’s set in the year 2055, but also the year 3999, because when you’re traveling through time, why not be as ridiculous as possible? This two-parter is far more structurally ambitious than the more character-centric “Days Of Future Past,” but it’s rollicking stuff that in the second episode sees Cable traveling back to the first episode to solve a problem. It’s comic book pulpiness at its best: too ambitious, reliant on weird deus ex machina machines (Cable has a time-travel cube that can do way too much), very open-ended (the future’s still dark), but exhaustingly brilliant all the same. “The Phoenix Saga” (season three, episodes three-seven): Working off the comics’ most-famous arc, the show kept fairly close to the source material this time: Jean Grey evolves into a super-powered alien being called the Phoenix after a near-death experience and leads the team into an intergalactic conflict featuring a birdlike alien race called the Shi’ar. It’s as ridiculous as it sounds, and at five parts, it was the most ambitious arc attempted yet by the series. But the finale (“Child Of Light”) is fun, crazy, epic, surreal stuff, and features a cackling space emperor villain of the highest order and a great conclusion (with a classic, easily reversed “comic book death”). The “Dark Phoenix Saga” that follows is just as good, just as insane, and just as spectacular. “Cold Comfort” (season three, episode 15): X-Men definitely existed in its own hybrid universe, but “Cold Comfort,” which introduces Iceman as a former member of the team who’s now on the outs, is an excellent nod to the series’ forebears, featuring flashbacks to the “original team” in the ’60s uniforms any comics nerd would immediately recognize. “Cold Comfort” also gives us Cyclops’ brother Havok and his super-team X-Factor, who in their early-’90s iteration were one of the most fun lineups around. Any episode that centers around Cyclops (who is the stiff to end all stiffs on this show) is hampered by his stern no-fun act, but “Cold Comfort” is one of his most memorable half-hours. “One Man’s Worth” (season three, episodes 20-21): Even after the long, majestic Phoenix arc, something like a comprehensive take on the “Age Of Apocalypse” story (a huge alternate-reality undertaking in the comics) was a bridge too far for this show. But “One Man’s Worth” was a decent summation, imagining a world in which Professor X was assassinated as a young man and Magneto leads a twisted version of the X-Men. “One Man’s Worth” got to play with every character’s look and sub in the reliable time policeman Bishop (at this point the show’s Doctor Who) to figure everything out. It also brought back Nimrod, one of the series’ more effectively creepy villains. “Sanctuary” (season four, episodes six-seven): By this point, X-Men was airing in weird chunks, with much of the long third season shoved into the fourth and fifth, hurting the serial nature of the series (one of its best qualities). But “Sanctuary,” written as the third-season finale, is one of the best Magneto episodes, giving him a real opportunity to explore his “leave us alone” approach to mutant-human relations with Asteroid M, an isolated mutants-only space station. Of course it all goes horribly wrong, but Magneto is a fascinating character for the show to explore as more of a flawed anti-hero, and Asteroid M is his grandest experiment. “A Deal With The Devil” (season five, episode three): By this point, the pulpy Cold War material that was so popular in superhero comics for many years was a little warmed over, but Soviet super-soldier Omega Red is such a fun villain for X-Men that it doesn’t really matter, and this is one of the last truly entertaining episodes as the series fizzled to an end. Omega Red is now being exploited by the U.S. government and takes Wolverine and Storm to a nuclear sub to try and stabilize it before turning on them in obvious fashion. It’s edgy, small-scale stuff for a show that usually leaned on more epic action, with some nicely intimate, suspenseful tension between Wolverine and Omega Red before all hell predictably breaks loose. And if you like those, here are 10 more: “Come The Apocalypse” (season one, episode 10); “’Til Death Do Us Part” (season two, episodes one-two); “A Rogue’s Tale” (season two, episode nine); “Mojovision” (season two, episode 11); “Out Of The Past” (season three, episodes one-two); “The Dark Phoenix” (season three, episodes 11-14); “Weapon X, Lies And Videotape” (season three, episode 19); “Proteus” (season four, episodes four-five); “Beyond Good And Evil” (season four, episodes eight-11); “Bloodlines” (season five, episode six). Availability: The entire series is now available on DVD in five “volumes,” although they are in airdate order, meaning they are out of continuity. Next time: The 10 most representative episodes of Quantum Leap.